We are a leading Exporter of lamination machine and cold lamination machine from Faridabad, India. 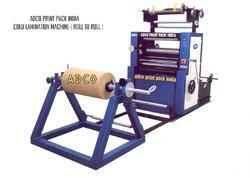 We are leading manufacturer of cold lamination machine in Faridabad , india . cold lamination machine not only adds value to paper board but also increases its quality and feet. Lamination Machine is especially designed for lamination of B.O.P.P/polyester/ PVC Matt film on printing paper and board of various length and width to produce attractive and durable packing or printing material , book covers & jackets, etc . The lamination of these items assures protection of packing from moisture , dust and rough handling . Furthermore , the cold lamination machine ensures best lamination due to its effective controls of guide rollers, effective rewinder , even distribution of adhesive on film and uniform pressing of film to paper or boards. Special sizes can be manufactured party specific requirement. 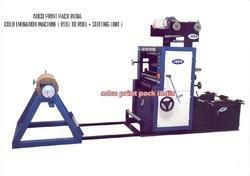 QUALITY OF THE MCHINE – THIS MACHINE WORK RELL TO RELL LAMINATION AND WITH ROLL CUTTING UNIT . QUALITY OF THE MCHINE – THIS MACHINE WORK RELL TO RELL LAMINATION .